Greg / February 28, 2014 / Comments are off for this post. When it comes to battling the flu virus, there are many steps you can take. Avoiding other people who may be sick, keeping your hands from rubbing your eyes, mouth or nose, keeping your hands clean, etc….. While these are all very important steps to avoiding the flu, perhaps the most important is identifying where flu germs hide in your home. This article from Enviro Maids, gives you some tips on where to find and fight the flu virus within your home. The telltale sounds of winter are in the air — coughing, sneezing, and sniffling. Trying to avoid catching the flu takes a lot of effort on your part — you constantly wash your hands, keep a safe distance from anyone who is sick, avoid touching your eyes, nose and mouth, and carry an arsenal of germ-killing hand sanitizer. While all these steps are important, one more step is necessary in the ongoing battle of the flu — getting rid of flu germs that lurk on surfaces throughout your house. While getting the flu vaccine every year is the first line of defense against catching the influenza virus, there are other preventive cleaning steps you can take to ensure you stay as healthy as possible this winter. The following cleaning list also is effective in preventing other viruses not covered by the flu vaccine, such as cold and stomach viruses. According to Flu.gov, influenza A and B viruses can live on a surface for hours to days. That means it pays to be extra vigilant when it comes to cleaning and disinfecting during flu season. When it comes to zapping flu germs, you must disinfect surfaces, not just clean them. Cleaning physically removes dirt and germs, while disinfecting kills germs. Flu.gov recommends using a disinfectant that’s registered by the U.S. Environmental Protection Agency (EPA) as being effective against killing flu germs. Visit their website for a full list. It’s important to ramp up your disinfecting routine during the flu season even before someone in your home comes down with the flu. That’s because according to the Centers for Disease Control and Prevention (CDC), people may be able to spread flu germs to other people one day before coming down with any symptoms. The flu continues to be contagious five to seven days after becoming sick. Clean surfaces first to remove excess dirt, crumbs, etc. Follow by disinfecting with an EPA-approved disinfectant. When cleaning surfaces touched by a sick person, use disposable paper towels instead of sponges and dishcloths. If you do use a sponge, WebMD.com suggests disinfecting it each time by zapping it (while wet) in the microwave on high for 2 minutes. You can also run it through the dishwasher. Remember: unless you’re disinfecting rags and sponges between uses, you’re only re-contaminating surfaces. Disinfect surfaces that are routinely touched — doorknobs, light switches, remote controls, cabinet pulls, and electronic devices. Clean and disinfect bathroom surfaces daily. Don’t neglect forgotten areas such as the toilet handle and medicine cabinet door or handle. Avoid storing toothbrushes together and don’t use the same toothpaste as someone who is sick. Use paper towels or assign each family member their own hand towel to use after washing their hands. Launder bed linens and blankets often during the winter months, especially the sheets of those with the flu. Wash and dry on the hot setting. When removing soiled linens, avoid having them come in contact with your clothing. Hugging a heap of laundry close to your body gives you a higher risk for contamination. Don’t forget to wash your hands immediately after handling dirty laundry. If a member of your household has the flu, try to contain them to one room as far away from the common living area as possible. The same goes for bathrooms; if possible, designate one bathroom to be used by the sick person. It’ll be easier to stay on top of the germs if they’re confined to one area. Keeping your home flu-free takes extra work on your part, but it’s worth it. Just remember: spring arrives next month and that means we’re that much closer to the end of the flu season! Greg / February 25, 2014 / Comments are off for this post. Remember beepers? Flip phones? AOL? There was a time when those were groundbreaking advancements in technology. Now, you can listen to an entire library of music, watch a movie, or just browse the internet while waiting at the bus stop all from your phone. It’s pretty crazy how much technology has changed in just the last decade. Well, the “green” community is advancing as well. In fact, some of the newest green gadgets were on display at the International Consumer Electronics Show, in Las Vegas. Here is an article from Enviro Maids, which highlights some of these new advancements in green technology. Pretty cool stuff. Each January, thousand flock to the International Consumer Electronics Show (CES) to catch a glimpse of the latest and greatest technologies and innovations in consumer products. This year’s show took place January 5-10 in Las Vegas and showcased an impressive array of state-of-the-art products. Our favorite products come from the “green” category, of course! Here are some of the standout green products for the home and why we love them. EverSense Thermostat by Allure Energy, Inc. This “smart” thermostat features a Wi-Fi touchscreen and Proximity Control Technology to make your home greener and more energy efficient. Proximity Control is a patented technology that controls and adjusts your home’s temperature while you’re away based on how near or far you’re from your house. While you’re at work or away on vacation, you probably adjust the setting on your thermostat to save energy while your home is empty. When you return home, you adjust the temperature back to your ideal setting. With EverSense’s Proximity Control, the thermostat works like a GPS system, sensing your proximity to your home and adjusts the temperature automatically before you arrive home. You’ll always come home to the perfect temperature. The EverSense thermostat works using the Eversense mobile app for iPhone or Android. This large capacity washer is huge in size and huge in savings. This 5.2-cubic-foot capacity washer features TurboWash Technology that gets through even large loads 20 minutes faster than traditional washers. LG’s ColdWash setting makes this washer even more energy efficient. According to the LG website, the ColdWash setting cleans as well as warmer settings yet saves you 60 to 91 percent more energy per load. This kitchen workhorse is perfect for entertaining. Featuring an infrared heating element, broiling time takes 20 percent less time than conventional ovens. According to the LG website, this electric, double-oven range is a breeze to clean thanks to the EasyClean technology. Unlike other self-cleaning ovens, this LG oven takes only 20 minutes to thoroughly clean and only requires water. No harmful chemicals! The secret is the enamel lining. Simply spray the surfaces inside the oven with water and press the EasyClean button. Twenty minutes later, wipe any bits of loosened dirt and you’re done! Save enough energy in a year to run an ENERGY STAR certified clothes washer for 11 months. Reduce greenhouse gas emissions by more than 6,000 pounds. Another useful feature on this energy-saving dryer is the VentSensor feature that notifies you if there’s lint blocking in the vent filter. Cleaning your vents regularly improves dryer performance. Greg / February 21, 2014 / Comments are off for this post. Nothing brings elegance and class to a room quite like a beautiful, sparkling chandelier. Unfortunately, even the most beautiful and expensive chandeliers lose their luster when they haven’t been properly cleaned and become covered in dust. So, how do you keep them clean? In this article from The Wall Street Journal, you get a look at a few ways some professionals clean and maintain these elegant light fixtures. Chandeliers bring elegance and shine to any room—until they’re due for a cleaning. How professionals maintain the notoriously hard-to-reach lighting fixtures. When the antique crystal looks a little too antique, when the romantic lighting goes from dim to dark, when each drop begs for a rub—it might be time to clean the chandelier. It’s easy to forget about them. Chandeliers are usually out of reach and they’re not always in the direct line of sight. That is, until cobwebs are the center of attention at a get-together. “You’re standing here because I had a dinner party and someone remarked at how dirty [the chandelier] was,” Brian Greene of Sparkle Chandelier Corp., based in Mount Kisco, N.Y., said one of his clients told him. These spectacularly hard-to-reach dust-collectors are often placed in the hands of professionals when it comes time to polish them, but even the experts don’t all use the same methods. The best way to clean these beautifully pesky items? It depends on whom you ask. This question started turning in the mind of professional cleaner Keith Campbell during a wedding he attended, when he noticed how ornate—and how dirty—the chandeliers in the hotel were. Mr. Campbell had been studying ultrasound at the library and remembered learning about an attempt in Japan to clean clothes using sound waves. “One day it just came to me, about how to apply it to the chandeliers,” he said. He developed a machine—a box with an open top that beamed ultrasound waves—that cleaned individual crystals when the machine was raised to surround each drop. Mr. Campbell brought his prototype to a Marriott hotel in Boston and offered to clean a chandelier. After seeing how well it worked, the general manager then gave him the whole hotel to clean—and a great recommendation, he said. “The rest is history,” said Mr. Campbell, the owner of Acu-Bright Inc. in Exeter, N.H. This system takes about 80% less time than other methods, he says, and the average home chandelier costs between $300 and $700 to clean. He has used the method on chandeliers worth millions of dollars, he said. But not everyone thinks new invention is necessary to clean a chandelier well. Sometimes it is simply a matter of repurposing a product that is already on the market. Chris Smith of Crystal-Smith Inc. in Brooklyn, N.Y., uses surgical soap—the same soap used to clean metal hospital instruments—for the job. Rinsing the cloth in a bucket filled with plain water between every rub is also important, he says, to keep the dirt from being reapplied. “You don’t want to use anything that’s corrosive,” he said. Cleaning of an average chandelier runs about $350, he said. 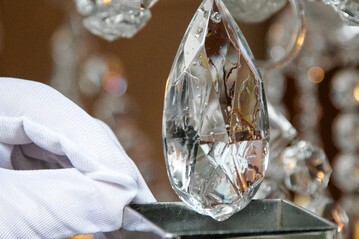 Mr. Smith also notes that metal hooks holding the crystal drops are usually gold- or silver-plated brass, and ammonia can take the finish right off. In general, chemicals can be harmful to chandeliers, stripping lacquers and metallic coatings. Mr. Smith does full restorations in his shop on chandeliers that require more attention than he can give from the top of a ladder. The chandeliers he sees in the store have often fallen into severe disrepair after years in storage. Others come to him after being purchased at an auction in poor condition. Sometimes the condition of the chandelier is the result of a leak or a fire where hoses were used. Water will leak down through the electric outlet and fill up the arms of the chandelier, he said. Good chandeliers are supposed to be airtight on the inside, he said. But in these more-extreme cases, Mr. Smith said he takes the chandelier apart, rewires it and re-pins the drops. These types of restorations can run in the range of $700 for a standard dining-room chandelier to $1,500 for a more elaborate, or more damaged, piece. Brian Greene of Sparkle in Mount Kisco, N.Y., says chandelier cleaning simply requires the tools you’d expect: a pair of hands and a meticulous eye. 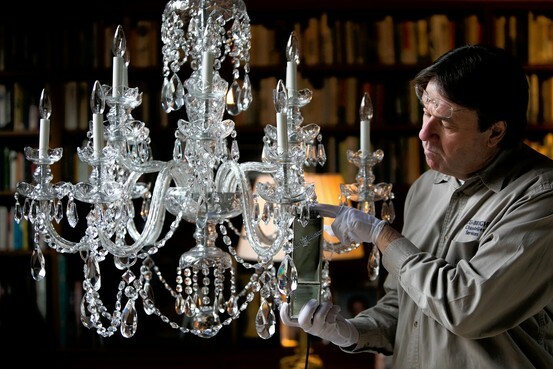 “We hand-polish ever single centimeter of the chandelier,” he said. “It can take hours.” His jobs run between a few hundred dollars and upward of $1,000, he said. Mr. Greene said he was brought in to clean a chandelier on the Upper East Side in New York City. It had hung in the apartment for 35 years without a cleaning. “It looked like a milkshake,” Mr. Greene said of the layers of dust giving the piece a frosted appearance. He polished it until it sparkled like new. It took nearly four hours. Greg / February 18, 2014 / Comments are off for this post. When it comes to the effects chemicals can have on people, none are more concerning than the lasting effects they can have on children. Recently, researchers have actually expanded the list of chemicals which can be particularly dangerous for young and even unborn children. In this article from USA Today, they list some of the most harmful chemicals and also give some tips on how to keep your children from coming into contact with them. So, if you are a parent or an expectant parent, I strongly suggest giving this a read. Two doctors sound the alarm again, as they did in 2006, about how certain common chemicals can contribute to various childhood disorders, and they expand their list of worrisome chemicals. Everyday chemicals are damaging the brains of unborn and young children, leading to conditions like autism, ADHD, dyslexia and lost IQ points, according to two prominent doctors. In an article published Friday in the journal Lancet Neurology, the two argue that chemicals should be better tested before being allowed on the market, and called for a global prevention strategy. “We need to do something to protect the next generation’s brains,” said Philippe Grandjean of the Harvard School of Public Health in Boston. This is the second time Grandjean and Philip Landrigan, a pediatrician at the Icahn School of Medicine at Mount Sinai in New York City, have sounded an alarm about the behavioral and brain effects of chemical exposures during pregnancy and early childhood. • Manganese, a natural chemical found in drinking water in places like Bangladesh. • Fluoride, in high concentrations, which has caused problems in China, though the low levels added to American drinking water are presumed safe. • Chlorpyrifos, an insecticide used on golf courses and in agriculture among other places. • Dichlorodiphenyltrichloroethane (DDT), an insecticide banned in the U.S. in the 1970s, but still used in some countries. • Tetrachloroethylene (PERC), a solvent used in dry cleaning and metal degreasing. • Polybrominated diphenyl ethers (PBDE), also known as flame retardants and often found in furniture, electronics and clothing, including children’s pajamas. Upsetting the careful balance of brain development can cause problems that range from a few lost IQ points to severe autism, Landrigan said. Pregnancy, he said, “is a vulnerable time.” A pregnant woman’s body is well designed to protect the baby in case of a fall, he said, but doesn’t do much to protect against chemicals, many of which can pass through the mother into the fetus. Low-dose exposures are not enough to make pregnant women sick, so they don’t know their fetus has received a harmful amount of the substance, Grandjean said. The chemical industry wasn’t any more impressed with the pair’s new study than with their 2006 publication. They criticize the scientists for focusing on chemicals whose problems are well known and quite out of the ordinary. “They then extrapolate that similar conclusions should be applied to chemicals that are more widely used in consumer products without evidence to support their claims. Such assertions do nothing to advance true scientific understanding and only create confusion and alarm,” according to the statement. Landrigan and Grandjean said they no longer consider chemicals like lead and mercury exceptions. The message of their new study, they said, is that many, many chemicals have similar damaging effects on the fetal and early childhood brain. “We’re now concluding there is a pattern here,” Grandjean said. The problem is that we simply don’t know the effect of more than 99% of chemicals on the market, they both said in separate phone interviews this week. The chemical industry is extremely concerned about safety and takes adequate precautions to ensure their products are safe if used as intended, according to the American Chemistry Council statement. Council members do agree with the scientists that the 38-year-old Toxic Substances Control Act needs to be updated. “A strong, comprehensive federal chemical assessment and risk management program enhances the safety of all Americans,” the statement read. 1) Eat organic food when possible during pregnancy. 2) Stay away from paint thinners, removers, pesticides and strong cleaning agents during pregnancy. 3) Get young children checked for lead exposure. 4) Ensure that sports fields are not sprayed with pesticides shortly before children use them. Greg / February 14, 2014 / Comments are off for this post. Today is February 14th, Valentine’s Day. The color most associated with Valentine’s Day is red, but this year perhaps you could infuse a different color, green. No, I’m not talking about money when I say green, instead I mean to come up with ways to celebrate this holiday of love by creating less waste, being more creative with your gifts, and saving some “green” (this time I meant money). Our good friends over at Seventh Generation, have compiled a list of 10 ways you can enjoy a greener holiday. Happy Valentine’s Day! 1. Create a memory As the song says, “It only takes a moment.” And experts agree that giving an experience, not a thing, makes us happier in the long run. Do a little advance scouting for a fantastic view — city lights, the sunset, the mountains in the distance – then take your valentine there. Bring along a little romantic snack, relax and just savor the moment together. 2. Eat in Valentine’s Day is one of the most notoriously difficult times to get a dinner reservation, which means every restaurant in town is overbooked and anxious to move your dinner along so the next romantic evening can begin. Skip the stress, set a beautiful table at home, and cook a meal together. You can relax, and spend the kind of time you’d never be able to enjoy anywhere else. 3. Create an edible greeting Skip the before and after waste that comes from greeting cards and “pen” your sentiments in icing on a cookie or a cupcake, then present it in person – no stamp required! 4. Share the love Before, after, or instead of celebrating as a couple, share a little love in places where people really need it. Bring Valentine’s Day treats to your local teen or homeless shelter, spend a little time in your local hospital’s children’s ward reading or doing simple crafts, or volunteer at your local animal shelter. 5. Watch a romantic comedy at home What’s more romantic – waiting in line to see the just-released romance in a crowded theater (during the height of flu season, no less) or curling up on the couch with a bottle of eco-friendly wine some snacks and your significant other to watch a classic romance? 6. Make some music Not super tech savvy? No worries. These days just about any type of music you want is just an online search away, which means you can create a romantic and highly personalized playlist with ease. You don’t even have to know how to burn the music to a CD – just share it directly online. 7. Say “I Love You” in another tongue There’s something about hearing someone tell you they love you in a different language that’s irresistible. This little exercise teaches you how to say, “I Love You” in fifty different languages. Practice together and see which languages speak to you! 8. Choose chocolate with care Valentine’s Day surely rivals Halloween as one of the most chocolate-laden holidays going. And let’s face it, chocolate is an easy, go-to gift that’s hard to resist. But before you grab for the nearest heart-shaped box full, think again. Cocoa farming is associated with some serious ethical and environmental problems. Choose fair-trade chocolate for a truly loving gift. 9. Put it into words A letter can say what no pre-written card can, and all you need is a piece of paper, a pen, and an envelope. Check in here for tips on saying what you feel. 10. Love yourself By choice or by chance, not everyone is in a relationship. For those of us going solo, Valentine’s Day can be unbearably annoying, or even depressing. You can ignore the day entirely, or you can devote some time to loving yourself! Treat yourself to a bouquet of organically grown flowers, indulge yourself with a spa treatment, a bit of fair-trade chocolate and the reminder that you don’t have to wait for someone else to make you feel loved. Greg / February 11, 2014 / Comments are off for this post. When it comes to using green cleaners or conventional cleaners some people don’t seem to care either way, as long as things get cleaned. A big reason some people may feel this way is because they aren’t aware of some of the dangers that come with certain chemicals which can be found in some traditional cleaners. In this very informative article from Green Cleaning Magazine, a common chemical called Triclosan, (which is used in many different soaps, detergents, and even toothpastes) is discussed and so are some the side effects it can have. After reading this, I think I’m going to be avoiding products that contain this chemical! This is the first installment of our ongoing series aimed to help you better understand the ingredients—both desirable and undesirable—in your home cleaning and personal care products. We arm you with information and provide a solid assessment of each ingredient so you can make educated decisions for yourself and your family. What it is: A chlorinated bisphenol in the form of a white powdered solid with a slight aromatic/phenolic odor; made from petroleum derivatives. How it Works: Triclosan has been shown to have antibacterial and anti-fungal qualities. In use since 1972, today triclosan can be found in soap, hand soaps, dish-washing liquids, laundry detergents, shampoo, toothpaste, deodorants and antiperspirants, cosmetics, shaving creams, and even carpet padding (used to deter mold), plastic lawn furniture, and pesticides. What’s the Problem? Triclosan has been brought under scrutiny because studies have shown that this ingredient can act as a hormone disruptor that’s been linked to reproductive and developmental harm in animal studies. In addition, it has been shown to produce carcinogenic chloroform when brought into contact with chlorine in treated tap water. Need any more convincing? • Amazingly, bio-monitoring studies have found triclosan in the bodies of nearly 75 percent of Americans over the age of six. • Laboratory studies have shown that triclosan is an endocrine disruptor capable of interfering with hormones critical for normal development and reproduction. Such hormonal interference has the potential to cause long-term health problems including poor sperm quality and infertility, and damage to the developing brain leading to poor learning and memory. Several studies suggest that triclosan also may contribute to the development of antibiotic-resistant bacteria, may exacerbate allergies, and may weaken muscle function. • Triclosan’s effectiveness as a cleaning agent and antibacterial has also been brought into question. In addition, this chemical is persistent—it has been shown to linger and work for as long as 12 hours after use. This fact creates more opportunity for harm. • Triclosan also endangers the environment. It’s been found in river sediment that’s over 30 years old and some fish have been found to have levels of triclosan in their systems thousands of times higher than of that recorded in the surrounding water. How Can You Avoid Triclosan? Read product labels and look for triclosan in the ingredient list along with product claims such as “antibacterial” and “odor-fighting.” You can also look for the mention of Microban or Biofreshon (both containing triclosan) on consumer goods like clothing and toys. Greg / February 7, 2014 / Comments are off for this post. As humans, we are making strides to be more aware of how we treat the environment, and are trying to reduce our carbon footprints. If you happen to be a pet owner, there are steps you can take to reduce your pets carbon footprint (or paw-print) as well. Here are a few tips from our friends at Seventh Generation, on how to “green” your pet. 1. Chow Down Just like mass-market human food, much pet food is highly processed and less than nutritionally ideal. Make your own pet food or opt for certified-organic pet foods with all the nutrition information on the label. These products should meet FDA standards for meat grading and strict USDA standards (look for the green seal) that ensure no antibiotics, pesticides, hormones, or artificial preservatives are part of what’s being served up at meal time. 2. Pick It Up Depending on what they eat, your pet’s waste isn’t necessarily terrible for the Earth. But the way you choose to dispose of it can be. Grab a bunch of biodegradable waste-disposal bags for your dog so their poo bag isn’t sitting in a landfill for a century. For cats, stay away from clay clumping litters, as the clay is strip-mined and can contain potentially carcinogenic silica dust. Instead, go for biodegradable litters made from pine pellets or recycled newspaper. 3. Find Friendly Fibers The fibers in collars, scratching posts, toys, leashes and bedding are all areas to check twice when greening your pet’s lifestyle. Choose fibers like organic cotton and biodegradable hemp for collars, leashes and bedding. It’s worth doing the same for toys: many plastic ones can contain lead. You can even find habitats and scratching posts made from bamboo or recycled cardboard (www.marmaladepets.com). 4. Wash It Out How many times have you picked up a product at the store or vet only to find that you had to use gloves to apply it? Shampoo and flea treatments are often packed full of chemicals of concern. If it can’t touch our skin, it probably shouldn’t touch theirs. For a simple way to determine what you don’t want in your pet’s shampoo, consider what you wouldn’t want in yours. If you avoid 1,4-dioxane contamination, your pet should too. If you would never consider lathering up with phthalates and parabens, don’t do it to your pet either! Flea treatment, though traditionally as chemically harsh as possible, can also be natural and sustainable. In fact, prevention can be the best solution. Bathe your pet regularly with natural cleaners. Vacuum your home at least once a week and dispose of the bag or its contents. Wash pet bedding in hot, soapy water at least once a week and use a fine-toothed comb on your pet. 5. Adopt In the United States, approximately 70,000 kittens and puppies are born every day. By adopting an animal from a rescue shelter, you can give a home to one of the 6 – 8 million dogs or cats that enter a shelter every year. Aside from the obvious benefits, adopting an animal can save shelters precious resources. What’s more, you can help control the pet population explosion by having your pet spayed or neutered. Greg / February 4, 2014 / Comments are off for this post. When you think of potentially harmful toxins that may be in your home, I’m sure it’s the usual suspects that may be found in traditional cleaners, pesticides. or even some beauty care products. However, I bet you didn’t think of most, if not all, of the places on this list from Seventh Generation, in which certain toxins could be found. Check it out, and maybe you’ll be as surprised as I was. At this point, we all know the drill: There are potential cancer-causing ingredients in those cleaners, pesticides on that produce, and hormonal havoc in the canned goods. Common trouble spots like these are hardly news. But not all hazards on the home front get this kind of press. Some hide in the strangest places. I’ll end with two items that are often overlooked and which surprised me not by being unhealthy (that I figured) but by being as toxic as they were. Finally, let’s look at flea collars. Most pet owners use them without a second thought. But one study found that after three days animals wearing them had enough pesticide on their fur to pose neurological risks to any kids they played with. After two weeks? Forget about it. (7) Stick to baths and other non-chemical solutions.